Where Are My Chopsticks? – Eat. Travel. Explore. It has been a while since I had last updated this blog, but today, I decided to take a look at my feed and look what popped up – this article on kueh on ladyironchef! (What are the chances, seriously.) Absolutely love the hand-drawn illustrations. If you are new to kueh or just confused at the mind-blowing variety, don’t worry, you are not alone. Check out ladyironchef’s introduction to kueh below for a brief introduction. If you want to learn more about this delicious Asian snack, feel free to browse through my earlier posts (here, here, here and here. Oh, and here too). My family and I came here to eat a while back! Just a walk down from the Botanic Gardens MRT, La Petite Cuisine is a casual, no-frills French bistro at the corner of a busy junction. It’s surprising that we don’t eat here at Serene Centre more often, considering how close we live to it. However, when we walked in for dinner, it dawned on me why – the place was really crowded! Our party of 5 barely managed to get a table outside (we had to make do with a 4-seater and an extra chair nearly blocking the narrow walkway). We definitely had the shorter end of the stick compared to the lucky patrons inside who were savouring the air-conditioning and the brighter lighting. Perhaps in some cooler climates, the outside seating would have made for a romantic setting, but not here in Singapore where the humid air just bears down on you and cars drive past with the occasional honk. But since there weren’t many options nearby (probably another reason why we hardly visit this row of eateries), we made do, even if pedestrians had to squeeze behind my chair to get past. Other than the items on the menu, there are also some specials which are written on a large chalkboard inside. I have no idea how often these specials change, but if you do come down for a visit, don’t forget to look out for these items! Orders are made at the counter, but there are servers who bring you your meal. Memorising orders for 5 people certainly isn’t easy; halfway through our mains, we realised that our dad forgot to order our starter! 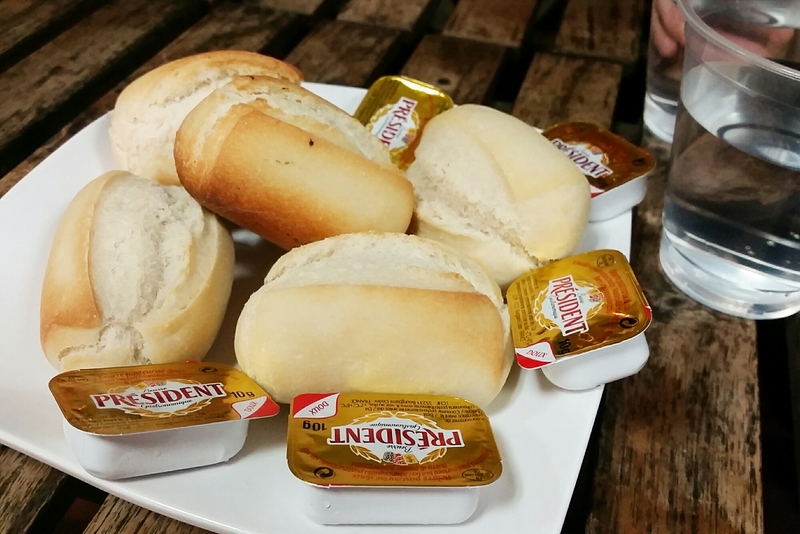 To kick-start our dinner, we had some bread rolls, which had a lovely toast on the outside and a warm, fluffy centre. I love places which serve bread before the actual meal. Not only does it help stave off my hunger while waiting, it also gives me something to do while making conversation! In any case, bread is always a good complement to soups, so this is definitely a plus point if you get any soup starters! At La Petite Cuisine, they have the typical French soups, like Mushroom Soup, Tomato Soup and Onion Soup. My family isn’t a big fan of Western soups, so we normally don’t order them unless they come in a set! 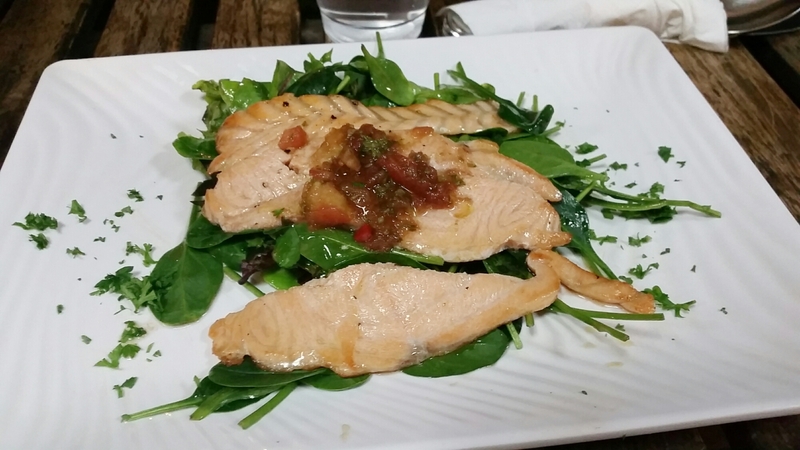 I wasn’t feeling particularly hungry, so I got a lighter main – Filet of fresh salmon w/baby spinach (S$16.50). It was well-cooked, and I loved how they managed to slice the salmon so thinly! The baby spinach was lightly seasoned and was a fresh complement to the filet, which was topped by a sweet, tangy sauce. The downside is that there isn’t much carbs on this plate, so I would recommend ordering a heavier starter, or perhaps saving your stomach for dessert! This probably isn’t the most appetising picture, but you’ve got to taste it for yourself to judge! This is one of their appetisers – Ravioli of prawns and foie gras in light lemon crème (S$16). Yup, this is the starter that my dad forgot to order, so we made him go back to order it! Honestly, this can be a meal in itself. Each of the three ravioli wraps around one prawn and a generous piece of foie gras. Needless to say, between the five of us, there wasn’t much to go around (half a ravioli, think about that), but even so, it was a delectable starter. I feel that it’s quite easy for the subtle tastes of the foie gras and prawn to be drowned out in the stronger taste of the heavier cream, but I think this dish balances both well. 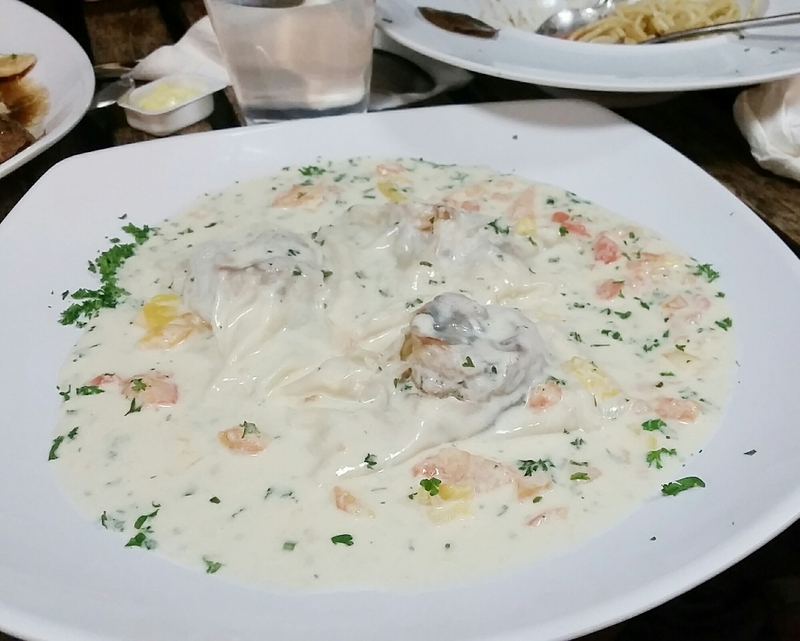 Also, even though I hardly order cream-based pasta nowadays, the sauce was still addictive! It was probably the citrus which really added that extra kick. I couldn’t snap pictures of the dishes the rest of my family ordered, but I tasted bits of them! My dad order the Sirloin steak w/gratin potato & salad (S$16.50), which had a really solid piece of juicy meat. I also tried my sister’s Confit de Canard w/gratin potato (S$17.50), which was another main that I was considering. I’ll probably get that the next time we drop by! I can’t remember what my mum and my brother got, but they were yummy. Sadly, we were all too full for some dessert, but we were still contented. Towards the end of our meal, the chef actually came out and greeted us! I think it’s wonderful that the chef does his best to build rapport among his customers – how often do you see that in Singapore? I could really feel the warmth, passion and pride that he has in his food, and for that reason, I’m definitely coming back a second time. Affordable French food – how much better can it get? 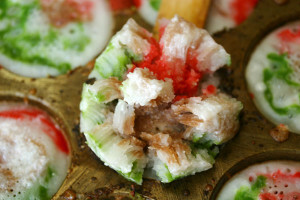 Kueh is a bite-sized snack or dessert originating from Southeast Asia. 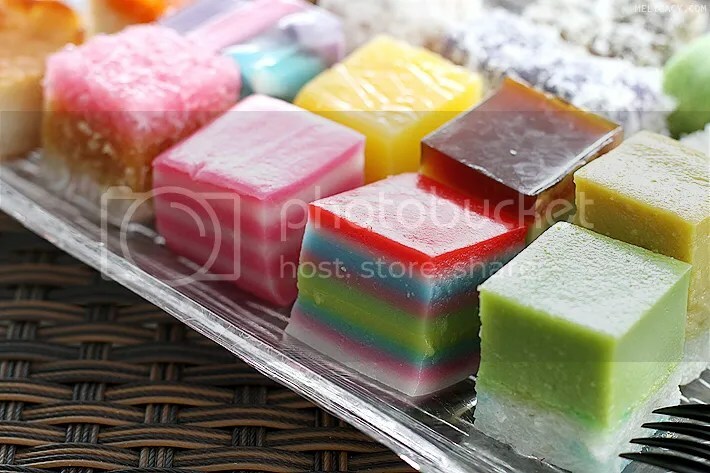 There are many different kinds of kueh which come in all sorts of colour, shape and size. Usually made from rice or glutinous rice, these kuehs are often steamed rather than baked, resulting in delectable treats that have unique textures, flavours and appearances from the ordinary Western pastry. What really pushed me to find out more about these snacks is the amazing variety out there! It’s incredible how many kinds there are. Often, I would get confused with the names (ang ku kueh? kueh lapis?) and the origins (Chinese, Peranakan, Malay or Indonesian? ), and pester my mum to explain the differences over and over again. With kueh being so ubiquitous in cosmopolitan Singapore, I felt that I really should find out more about these treats myself. Read on to explore more about the second series of kueh – Malaysian/Singaporean! This is quite similar to the Kue Clorot in the previous post! 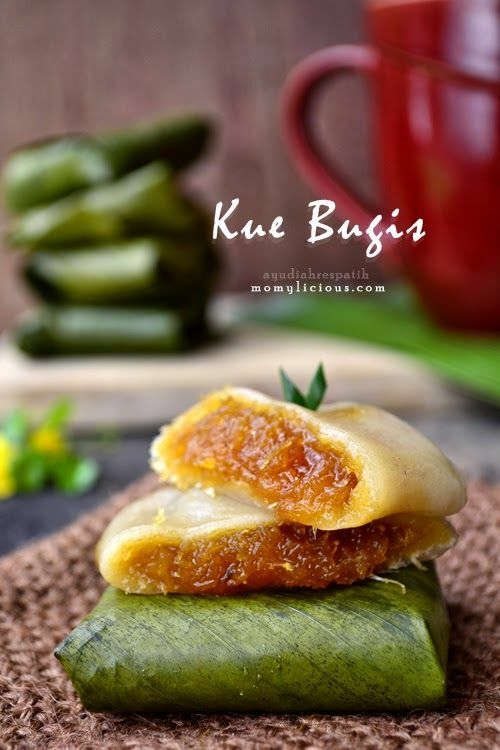 A traditional snack of Brunei and Sabah in East Malaysia, this kueh is made of rice flour and gula apong (nipah palm sugar – different from gula melaka, which is made from coconut palm!). It is then rolled with palm leaves into cones and steam cooked. 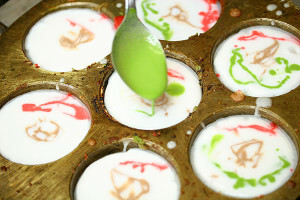 Often, some flavour is added, such as pandan (like in the picture above, which gives the cake a green colour) or durian (normally yellow). This infographic went viral earlier this year during CNY, leaving many of us a bit more uncomfortable as we feasted. There are many versions of love letters around, not just from commercial shops but also from precious family recipes. My friend makes a mean love letter and every year when I visit, I am both impressed and fascinated by how she makes them! Well, so I went to search up this mysterious process (not so anymore!). Basically, after making the coconut-flavoured egg batter, the batter is poured into an iron mold, which is traditionally heated up on a charcoal stove. When the batter is baked, it is removed and folded before the biscuit hardens. The beautiful thing about these snacks are that they are etched with decorative and auspicious animal motifs (such as fish, roosters and snails) thanks to the molds. 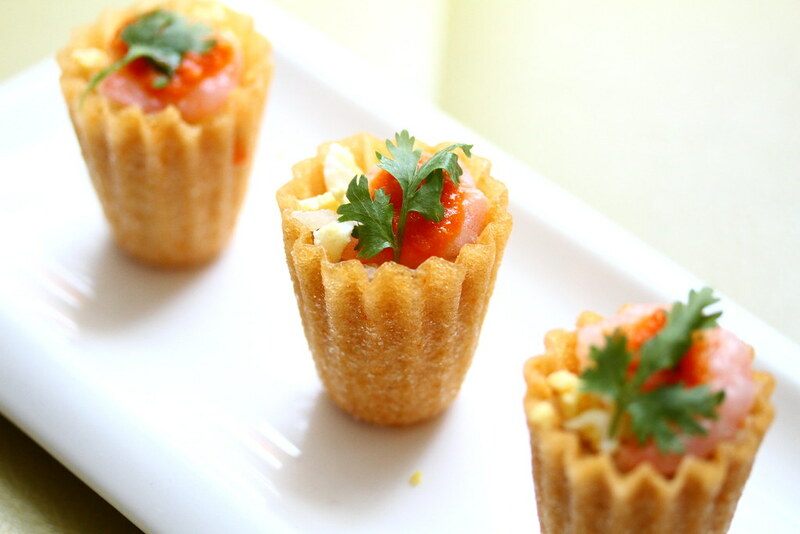 I already can’t wait for the next CNY – these snacks are gold. I’ve finally found a kueh that uses sweet potato! These fried doughnuts are made with a sweet potato batter and rolled in caster sugar for a sweet finish. Surprisingly, even though these kuehs look like doughnuts (and are just as fluffy), no baking powder or yeast is used! I would look out for those calories though – I could imagine eating a handful and busting my limit already. This glutinous rice dumpling, popular in Singapore, Malaysia and Brunei, is usually filled with a sweet paste like grated coconut with gula melaka. It is shaped in a pyramid and wrapped with banana leaves. This reminds me of the previous kuehs! I kind of recall other kuehs having a similar concept – a filling wrapped in some rice flour. Also, I find the name rather cute! It makes me think of the Japanese mochi (oh, the cravings are coming). Another popular kueh which everyone thinks of when they hear ‘kueh’! There are two versions (baked and steamed), but people use this term for both kinds. The baked version, aka Kek Lapis (layered cake) is happily featured in our enlightening infographic above, since it is a common Chinese New Year snack. People often do not realise how dense this addictive cake really is! The other kind, the nonya kueh lapis, is made from rice flour, coconut milk and sugar. This is quite unlike the cake one, which uses the ordinary baking ingredients like butter, wheat flours, eggs and sugar! Another difference is that this one is steamed. I really love the fun of eating this rainbow kueh – you could either eat several layers at once, or peel each layer apart! You can only imagine how my eyes used to light up when my grandma brought these colourful kuehs back home for an afternoon treat. Anyhow, either cake is incredibly tedious to make – every layer is individually baked or steamed! You really need quite a bit of patience to see this process through. Something else worth noting is that food colouring is used to differentiate between the different layers. 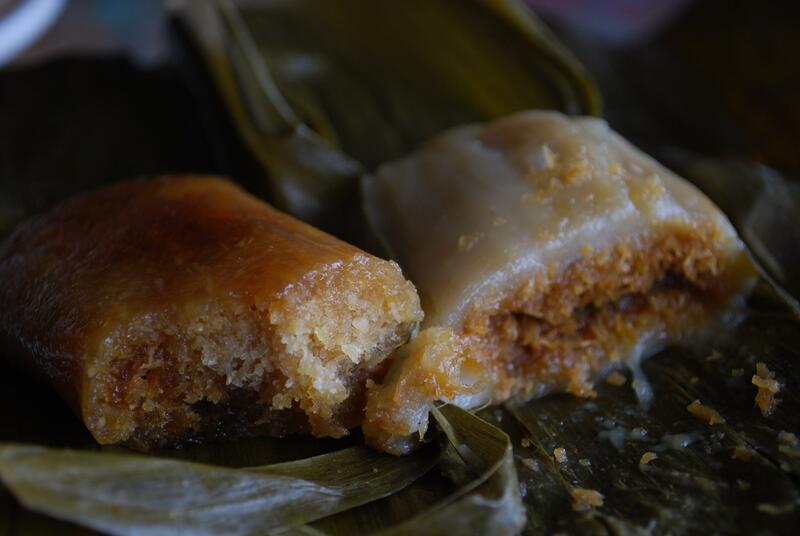 Kuih lidah (lidah means ‘tongue’) hails from the Bruneian Malay community of Papar in Sabah, Malaysia. This is a pretty simple cake – it only needs rice flour and eggs. However, the result is an adorable oyster-shaped cake! I’ve never tried this before, so I’m really curious what the texture is like. I absolutely love this! Another Chinese New Year favourite (though that’s the only time when I get to enjoy this delicious treat), kueh pie tee is essentially a thin, crispy pastry shell filled with all sorts of ingredients. The main filling is shredded Chinese turnips (or jicama) and carrots; but that’s only half of it! For the rest of the shell, I like to fill mine with chopped up eggs, tiny prawns, peanuts, sweet dark sauce, chilli sauce. After that, I’d top this Nyonya specialty off with a bit of parsley or coriander! It may seem like a lot of effort for such a tiny thing (most locals don’t mind meticulously assembling this shell by themselves). But trust me, when you put that entire shell in your mouth and feel that burst of flavours on your tongue… nothing can beat that feeling of just plain, good food. This saucer-shaped deep-fried fritter looks as good as it gets. With crispy edges and a dense, chewy texture in the centre, kuih pinjaram is known by many names, including kuih UFO! It also bears an uncanny resemblance to another kueh (kueh cucur). However, unlike kueh cucur, this kuih doesn’t use coconut sugar. Instead, this kuih is made simply from rice flour, corn flour, milk and oil and is commonly sold in street markets in East Malaysia. Pandan leaves are sometimes added, enriching the fragrance of this sweet snack. Read on to explore more about the third series of kueh – Indonesian! 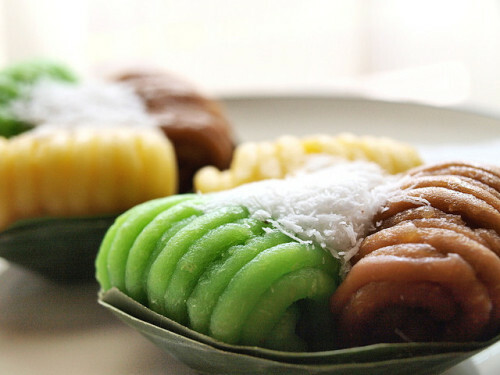 This green-coloured kueh, which gets its colour from pandan, is made up of a steamed glutinous rice flour and tapioca dough, and filled with grated coconut and coconut sugar. It is then wrapped inside banana leaf. I’m pretty sure I’ve tried this before… maybe from Kedai Kue Kue? I’m not sure, but I certainly can imagine what it probably tastes like – yummy! This has the same texture as the porous cake (kue apem) in the previous Kueh Fridays post. This one has a unique shape – blossoms! Made up of rice flour and coconut milk, this colourful but simple cake is certainly a sight to behold. It’s made with the help of a special mold – sort of like a paint palette! The dough is first poured inside, before the colouring (mixed with coconut milk) is specially drizzled on top. The result when the cake puffs up is definitely something to brighten up your kitchen and dining room! 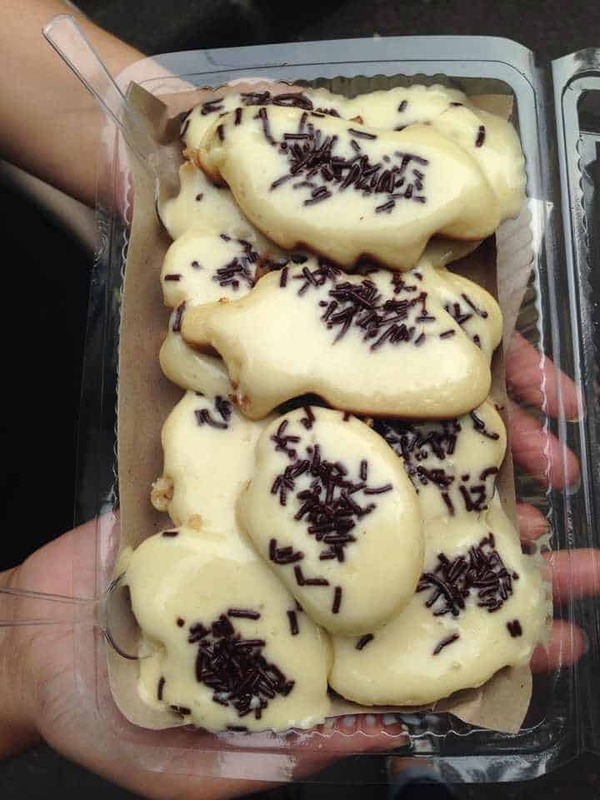 Kue Cubit is one of the more famous Indonesian snacks around. Its strange name (“kue cubit” means ‘pinch cake’), comes from its small size, which results in people having to pinch it to eat it. This kue uses only flour, baking powder, sugar and milk, but the result is a very cute, and I would suspect, addictive, snack! Basically the liquid dough is poured inside a steel plate with several small round basins, giving the kue a round shape. Meises (chocolate granules) are then poured on top of it before the seller uses a special hooked stick to take the cake off from the steel plate. Literally ‘Trumpet Cake’, this kue is made of a sticky dough comprising of glutinous rice flour sweetened with coconut sugar (gula melaka?). This dough is then filled into the cone-shaped janur (young coconut leaf), and steamed until cooked. It looks wonderfully tasty! The fun way of eating this is to carefully unwrap the swirled coconut leaf and eat it like an ice-cream. This pancake is famous for being sweet and fibrous! 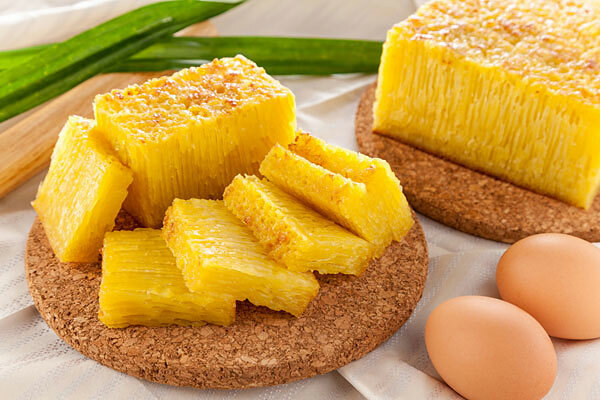 Made of fried rice flour batter and coconut sugar, this kue is normally served at local celebrations in Indonesia. This doesn’t look like something you should be taking on a daily basis (well, it’s fried), but trying it just once won’t mean I’ll bust my calorie limit too often. This is pretty similar to a kueh I had in my second post of this series (I believe it was called kueh dadar as well). But for the sake of a refresher, I shall explain this kueh again! This kueh is essentially grated coconut with coconut sugar, wrapped inside a thin dadar (omelette) made of rice flour. This dadar is usually green in colour, as pandan leaves are used. This is one of the most common kuehs I see around! This kue is traditionally made of cassava flour and coconut sugar, and served with sweetened grated coconut. I can’t really remember whether I’ve ever tried cassava fruit before, so I can’t really imagine how this tastes like! This cake is normally made with pretty colours, which makes for an interesting combination with its stringy shape. There are also many variations in taste, from strawberry, chocolate, and vanilla to even cheese! This coconut cake is a specialty of Manado city, located in North Sulawesi. Influenced by the Dutch who had previously occupied this city, klappertaart has two types – a more solid form (baked) and another non-baked version which supposedly melts in your mouth. It only needs a few basic ingredients: coconut, flour, eggs, milk and butter. I wonder how this sinful cake tastes like? I’m sure it must be excellent for the locals to keep eating it despite its high calories. I’m learning so much about all the different kuehs out there, and it’s absolutely fascinating! Truthfully, I still feel very much in the dark about this sweet treats, but I’m slowly uncovering each stone. I can’t wait to share more about these kuehs in the weeks to come! Indonesian kue, or occasionally spelled kueh, are popular snacks in Indonesia. There is a wide variety of Indonesian kueh, each reflecting a certain influence, be it local, Chinese or even European. In the Indonesian language, the word kue refers to not only these traditional snacks, but also all types of cakes and some types of pastries. Because of this, there are two types of kues, divided according to moisture content – kue basah (“wet kue”) and kue kering (“dry kue”). Most kue kering are technically pastries and many Western cakes can be considered as kue basah. Here are some Indonesian basah kueh! This is a kueh made from rice flour, pandan, sugar and coconut milk. It is essentially a thin, green batter pancake with a crispy edge and a thicker, brown part in the middle. Apparently it’s quite a popular traditional snack with the local Indonesian school kids! When I read up on this kueh, I was quite amused by the other name that the locals call it – kue tetek (breast cake). No prizes for guessing why. 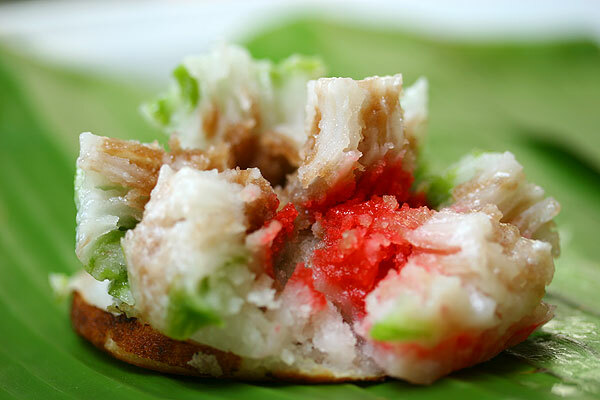 Similar to Malay apam, this kue is made of cassava tapai, coconut water, coconut sugar, rice flour, and coconut milk. All these are mixed to form a dough, and then steamed until the dough is fluffy and cooked. It is usually served with grated coconut. Even though I may not have tried this exact Indonesian version, it looks very similar to the steamed cakes that I often find around Singapore! I love how there are so many colours, even though the traditional one is brown (the one in the top picture is flavoured with gula melaka, while the one at the bottom is probably flavoured with rose water). 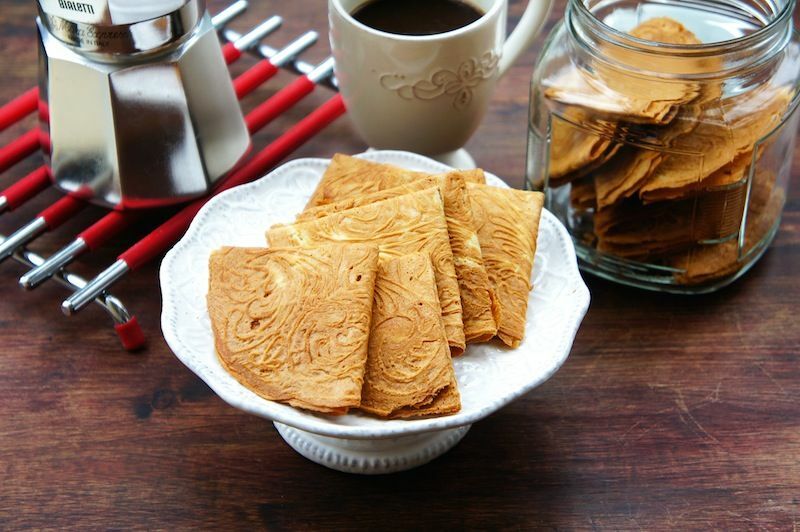 A lovely bean-filled Chinese pastry originally introduced to Indonesia by Fujianese immigrants. This really reminds me of the Chinese tau sar piah – it bears an uncanny resemblance, and has similar ingredients as well… which means there’s a high chance that I will love this pastry if I ever get the chance to try it! This is a yellow cake made from tapioca flour, eggs, sugar and coconut milk. It has a unique porous texture, which I find very fascinating! Apparently, it’s the yeast used that gives this dessert its characteristic feature – the yeast creates bubbles, which results in a spongy texture when baked. Traditionally sold in pandan flavour, it also now comes in other flavours like banana, durian, cheese and chocolate. I’m really curious about the cheese flavour actually. I think I’ve tried the original kue, but I don’t think I’ve tried the other versions. In Singapore, some call this cake kueh bengka ambon. 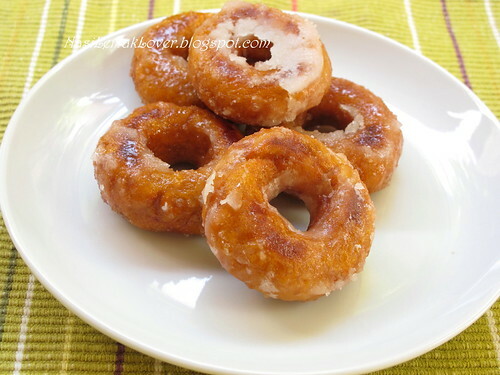 Here’s a recipe if you want to make this yourself: http://kitchentigress.blogspot.sg/2012/09/kuih-bingka-ambon-video.html. Translated as “Potato Cake”, this kue is made from mashed potato, flour, eggs, sugar, coconut milk, vanilla, milk and margarine. This is all mixed as dough, then baked until golden brown and cooked. I think this is a pretty versatile cake, in the sense that it can come in all sorts of shapes, from flowers to circles. This one looks like the croissant! Kue bolen is a baked pastry with crust layers and a filling of cheese and banana (and in others, even durian!). This looks like a fantastic fusion between European and Indonesian food – where can I get this in Singapore? Another kind of steamed bun made of flour, sugar, eggs, margarine, and vanilla or chocolate flavouring. Unlike the earlier kue apem, this one doesn’t use coconut, which I guess makes it a regular steamed bun. This version is probably more similar to the ones which are easily available at the convenience stores here! I love the creativity that people have with the colourings – it gives the cakes a fun, edgy feel. I can easily say that I haven’t tried most of these Indonesian kuehs! Hopefully one of these days, I’ll be able to make a trip down to try these treats. Until then, I can only drool at the wonderful pictures that other people have posted! I absolutely love Peranakan/Nonya food! As my family loves going to shopping centres, our favourite Peranakan restaurant is Grandma’s. It’s a pity that I don’t really know how to cook anything from this cuisine, but it’s alright – I’ve heard from my mother that this cuisine has one of the most tedious and time-consuming preparation and cooking processes! I’m not sure whether I have the patience to venture into this part of the cooking world; I’m much happier just eating. For those who are unfamiliar, the Peranakans are Chinese immigrants who settled in South East Asia (mainly Malaysia, Singapore, and Indonesia) during the early days and intermarried with the local Malays. If you’re wondering what Nonya means, this old Malay word is actually a term of respect and affection for women of prominent social standing (part “madame”, part “auntie”) and has slowly come to refer to the Peranakan cuisine. As you can guess from its history, Peranakan is a fusion of Chinese and Malay food – a mix of Chinese ingredients as well as the local spices and cooking techniques used by the Malays. Some of the common ingredients used: coconut milk, galangal (a cousin of ginger), candlenuts (for flavouring and thickening), laksa leaves, pandan leaves, belachan (shrimp paste), tamarind juice, lemongrass, torch ginger bud (normally found in assam laksa), jicama (a kind of turnip/root), kaffir lime, rice/egg noodles, and cincaluk (a special sour condiment that I’ll be explaining about in my next Peranakan Delights post!). Even though recipes differ across regions (e.g. Singapore’s laksa uses a lot more coconut milk than the northern assam laksa), these ingredients can generally be found in most Nonya dishes. Okay, so this is the first part of Peranakan Delights, where I will document some of these wonderful dishes! A popular condiment, acar is surprisingly packed with flavour despite its apparent simplicity. I absolutely love this, whether it’s served with prawn crackers, chicken curry or even chicken rice! I would eat in alone if I could (often I do) – that’s how much I love this complex mix of pickled meats and vegetables. Some common ingredients are cucumber, carrots, cabbage, peanuts, kaffir lime, shallots, sugar, pineapple and dried chillies. The sweetness and acidity of the acar complements rich courses like nasi goreng (fried rice), satay and most varieties of soto (a type of Indonesian soup) excellently! Of course, this condiment is very versatile and has many variations which include other ingredients like lemongrass, ginger, eggplants, and even ikan bilis (fried anchovy). 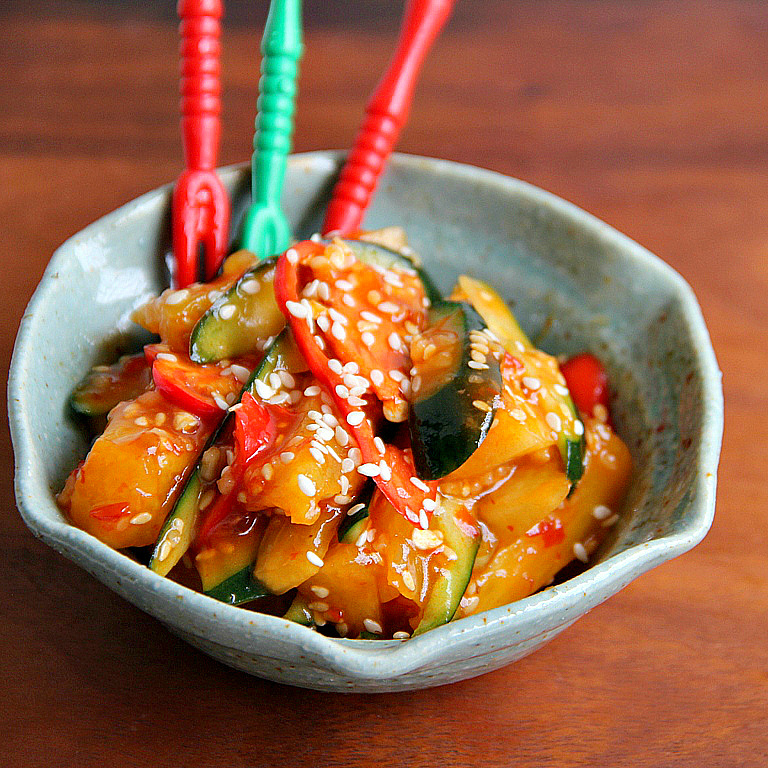 There was once when I volunteered at Willing Hearts and made acar with sweet Thai chilli sauce! 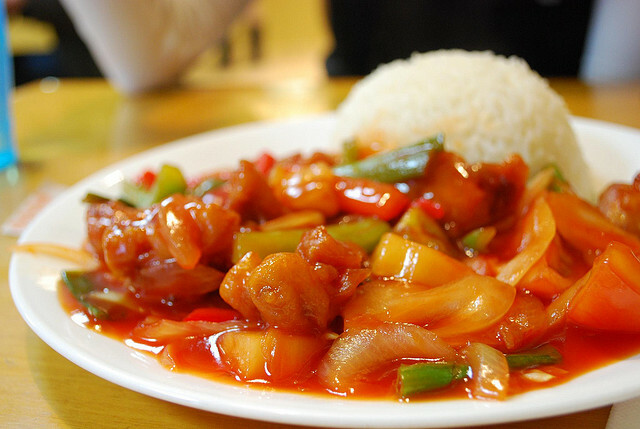 Anything goes with this dish, as long as it comes out sweet and sour. Considered one of Penang’s three signature dishes, assam laksa is essentially a sour and spicy soup (asam means ‘sour’). This fish-based soup (usually shredded mackerel) is a very complex dish – no surprises! Besides the translucent white rice noodles (aka vermicelli), there are a whole bunch of finely sliced vegetables which are either incorporated into the soup or added as toppings: tamarind (both kinds – asam jawa and asam gelugor), daun kesum (Vietnamese or laksa mint), cucumber, onions, red chillies, pineapple, lettuce, “daun kesum” (Vietnamese mint or laksa mint) and pink bunga kantan (torch ginger flower). This is then topped off with a thick, sweet dollop of shrimp paste, which is called petis udang or hae ko (蝦糕). My mum absolute loves this laksa version! I still prefer the Malacca/Singaporean version i.e. the one which uses coconut milk, but it’s all personal preference I guess. For me, I love the complexity in the dish! People who love tom yam will probably like this as well. Another of my mum’s favourite dishes! I really love buah keluaks, though I was initially a bit hesitant (and lazy) to dig out blackist bits from a tough nut. Buah beluaks are nuts from the Kepayang tree, a mangrove tree that grows in Malaysia and Indonesia. I think this is an acquired taste (like durians), but the effort for this truly unique flavour is worth it! Anyway, ayam buah keluak (ayam means ‘chicken’) is a chicken dish cooked with these nuts and is very hard dish to make – indeed, the rempah (pounded spices) alone is made up of 7 ingredients and takes half a day to fry! And I haven’t even mentioned the scrubbing for each and every nut, the 2 days of soaking them, and the half a day of simmering with the chicken and rempah for the sauce to thicken. It’s a hundred times easier to just head down to a Peranakan restaurant to savour this dish than to cook it yourself! Trust me on this one. 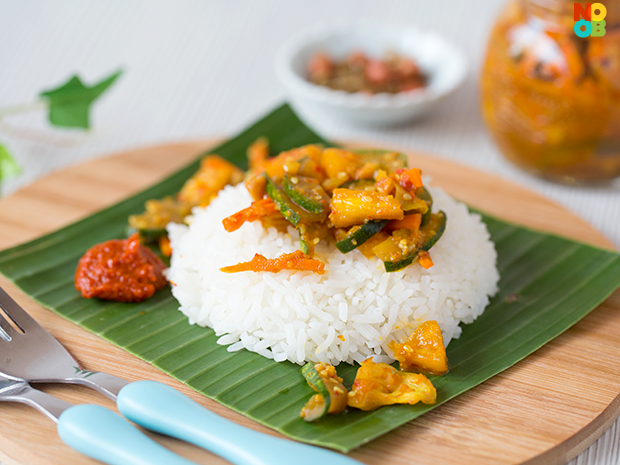 As this dish is relatively easy to prepare compared to many other Peranakan dishes, it’s quite a popular dish to make. In fact, my mum has made babi pongteh several times, most notably for our annual CNY reunions. My relatives always love it! Indeed, traditionally, this dish is served during special occasions like celebrations or family gatherings. This is yet another stew cooked with pork (babi means ‘pork’), but using tamarind juice instead! This gives the dish a more spicy and sour taste. People have used different cuts of pork for this stew, from the main meat to the leg to even the cheeks. The most popular cut by far, however, is the pork belly, with its fats in full glory! As the stew braises, not only does the meat become very tender, the fats also infuse into the dish, making the sauce extremely tasty. 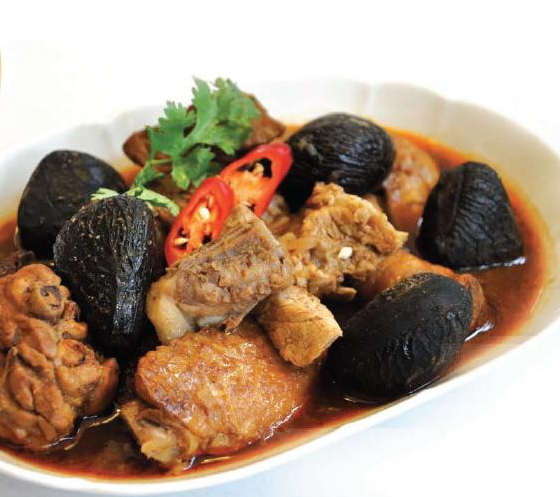 Popular within the Kristang community (also known as the “Portuguese-Eurasians” or the “Malacca Portuguese”), babi assam really is a classic Peranakan dish. Hope that was a helpful introduction to this amazing cuisine! This October, I’ll be starting on a brand new journey in university! I’m pretty stoked to start already, but there’s still 6 months left before I fly off. Before then, I will be documenting all the meals I can create with just a microwave, because my college doesn’t have a full kitchen (i.e. no cooking stove) due to safety reasons. I’ve got a feeling that I’ll miss good Chinese/Singaporean/Asian food when I’m there, so I’ve decided to embark on this personal project to find amazing microwave recipes! I’ll be kickstarting this series of posts with some Thai (one of my favourite cuisines) and Chinese food. Total microwave time: 14-17 minutes Mix the curry paste and oil or coconut milk, and microwave on high for 3/4 minutes. Add the chicken and stir. Microwave on high for 4 minutes (or medium for 8 minutes) – make sure the chicken is cooked! After making this base, add the rest of the seasonings. Add coconut milk, basil, soy sauce, red chilli, lemon grass, and lime leaves. Stir and microwave for another 4/5 minutes. Stir again and let it rest for 3-4 minutes before serving. Add sugar, pepper, garnishes (e.g. scallions, cilantro) and/or fish sauce, depending on how it tastes like! Serve with plain steamed rice. This can easily be used for Indian curry. Total microwave time: 8-12 minutes I absolutely love Sticky Rice with Mangoes! I lived in Thailand for a few years as a kid, and this is still one of my favourite desserts. Okay, the one thing I didn’t know about this dish is that you have to get a special kind of rice (not just any kind e.g. jasmine or basmati). It’s called “Sweet Rice”, which gets sticky after being cooked! After getting the rice, this dish is pretty simple to prepare. Soak the rice for 10 minutes in warm water. The water level should be just above the rice level. Cover the dish and microwave for 5-7 minutes. Stir the rice and lift the rice from the bottom to the top. Microwave for another 3-5 minutes. If it’s all cooked, all the grains should be translucent; if not, just heat it up for another few minutes (it really depends on your judgement). For the dessert, mix in sugar and coconut milk, cover, then let the dish stand for 20 minutes. Serve with mango! If not, sticky rice goes really well with normal Asian dishes as well. Total microwave time: 6-8 minutes Combine oil, garlic, ginger and onion in a glass casserole, and cook uncovered on HI for 1 minute. Add carrots and green pepper, stir, cover with lid, and cook on Hi for 2 to 3 minutes more. Stir in asparagus, cabbage, soy sauce; cover and cook additional 2 to 3 minutes on HI. Toss in mushrooms and cook for an additional 1 minute. Let sit covered for 3 minutes. Serve. 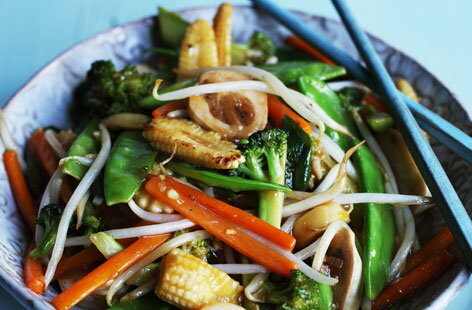 I would imagine that this recipe has a lot of flexibility in terms of what veggies to use! Fish is my favourite kind of meat (nothing beats Han Kee fish soup at Amoy), so naturally, I have to include a fish dish in this first list! Total microwave time: 5 minutes First, defrost the frozen fish before steaming it in the microwave so it cooks evenly. For the marinade, combine soy sauce or tamari, with a splash of rice wine vinegar or mirin and a splash of sesame oil in a microwave-safe dish. Use just enough to come about halfway up the sides of the fish when it’s placed in the liquid. Stir in minced ginger, chopped scallion and black pepper. Marinate the fish for about five minutes, turn the fish over, and marinate the other side for another five minutes. Cover the dish with microwave-safe plastic wrap, and cook on high for 3-5 minutes, depending on the thickness of the fish (1-inch thick fillet –> four minutes). The fish should be opaque all the way through the thickest part when safely cooked. Tada! 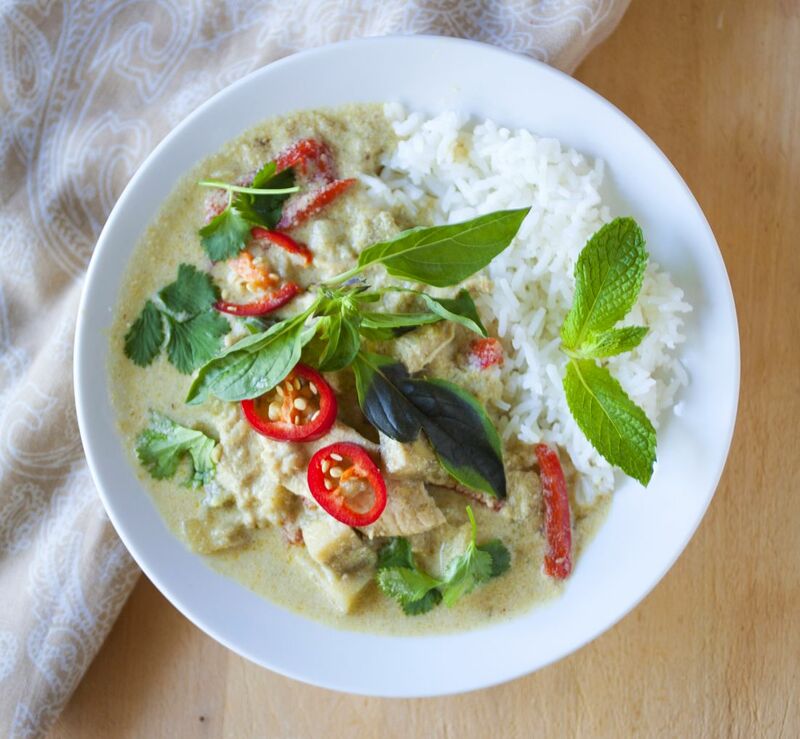 Serve with rice and add garnishes (cilantro, parsley, chilli, ginger etc) to complete the dish. The quintessential Chinese dish! The sauce is pretty easy to make once you make the ingredients, which is great. The proportions of each ingredient differs from recipe to recipe, so I guess it really depends on your tastebuds! I guess it’ll be good if I experiment before going over to the Foreign Land. Total microwave time: 11-15 minutes In general, for the chicken version, mix ketchup, apple cider vinegar, soy sauce, sugar and garlic thoroughly in a large microwaveable dish with the chicken, onion and peppers. Microwave, uncovered, on High for 8-10 minutes until the chicken starts to cook and the sauce is sizzling. Stir in the pineapple pieces and sugar snap peas and microwave for another 3-5 minutes until the chicken is completely cooked. Leave to stand for a few minutes, then stir in the cashews (optional but great to have) and serve. If it’s just the sauce you’re looking for, it’s even simpler: combine ketchup, vinegar, soy sauce, sugar, cornstarch and water, then cook on high for 3 minutes or until the sauce starts to boil. Pour over the meat, and there, you’re done! That’s 5 dishes already! Looks like I’ve got a lot of experimenting in the kitchen to do. They probably won’t turn out as delicious as those in restaurants, but I’m sure they’ll be good enough to bring back memories from home!